All investors want to grow their assets; some want to help the world as they do. For these investors, financial advisors need to be sensitive to their wishes to prioritize socially responsible investing. Feelings toward socially responsible investing have not changed for a significant majority of Affluent investors (69 percent), according to Spectrem Group research, but there is a larger percentage of those who indicate more interest than in the past (19 percent) compared to those who indicate less interest (13 percent). Across all age groups it is younger investors who are expressing a growing interest in socially responsible investing (30 percent of Millennials and 23 percent of Gen Xers, compared with 20 percent of Baby Boomers and 17 percent of World War II era households). In what types of socially responsible investments are affluent investors most interested? In some cases, it is in the types of companies they most want to avoid, such as companies whose practices impede human rights or that have inadequate pay. Affluent investors interested in socially responsible investing also indicate they want to avoid companies that produce or solicit products that are either physically or socially harmful to the consuming public, or that are perceived to do harm to the environment. On a positive note, affluent investors with an eye toward socially responsible investing are looking to invest in companies that encourage and foster environmentally friendly practices. There is also high interest in companies that encourage and promote diversity and have specific programs in place that create a diverse workforce. 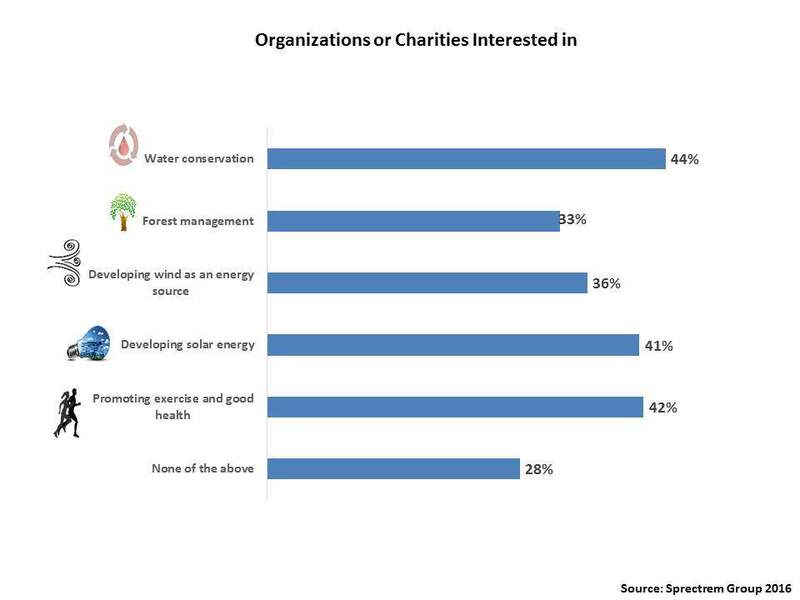 Specifically, the largest percentage of socially responsible investors are most interested in organizations for charities devoted to water conservation, followed by promoting exercise and good health, developing solar energy, developing wind as an energy source and forest management. Spectrem research analyzed by age finds that Baby Boomers and Seniors age 65 and older (comprise the largest percentage of investors who want to invest in companies and charities that support water conservation and developing solar energy. The largest percentage of socially responsible Millennials are most interested in investing in companies or charities that promote exercise and good health, developing solar energy and water conservation. · Ask investors about their interest level in socially responsible investments. In many cases, this may be an area in which they have not given much thought, or mistake for being a charitable donation. · Familiarize yourself with different types of socially responsible investments. To the extent that you are aware of the initiatives various companies have in these areas, you may be able to interest them in other socially responsible investments. · Familiarity with socially responsible investments could be a gateway to your clients’ children or with Millennial and Gen X investors, who indicate an increasing interest in these types of investments.